USPA NEWS - - "LES SPECTRES DE LA TERRE BRISEE" (Wraiths of The Broken Land) by S. Craig ZAHLER and Published by Gallmeister Editions in FRANCE. Originally Published in 2013 in USA, the Story is set in Mexico around 1900 with Two Sisters forced into Prostitution at a Gentlemen’s Club. The Sisters’ Two Brothers and their Father attempt to rescue them through their Outlaw Gang which also includes a Former Slave, an Indian and a Brutal Gunman. 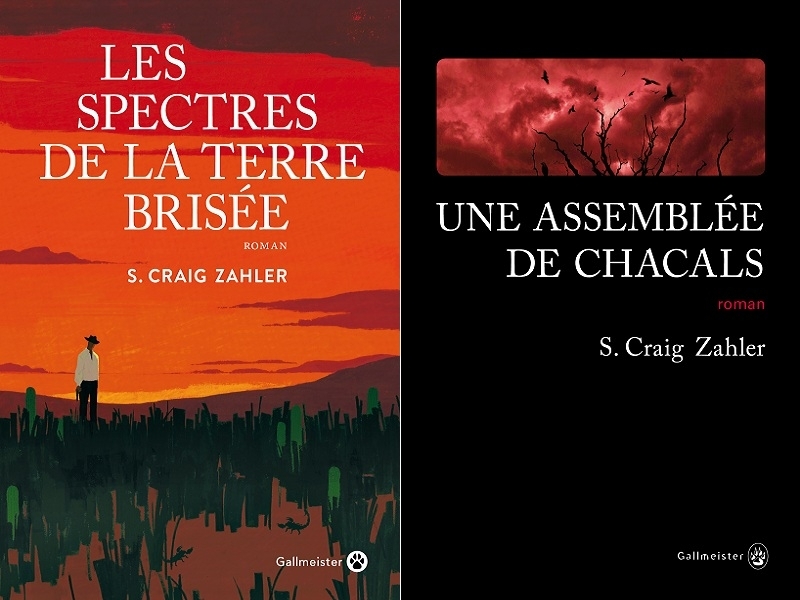 - "LES SPECTRES DE LA TERRE BRISEE" (Wraiths of The Broken Land) by S. Craig ZAHLER and Published by Gallmeister Editions in FRANCE. Originally Published in 2013 in USA, the Story is set in Mexico around 1900 with Two Sisters forced into Prostitution at a Gentlemen’s Club. The Sisters’ Two Brothers and their Father attempt to rescue them through their Outlaw Gang which also includes a Former Slave, an Indian and a Brutal Gunman. This Gritty, Character-Driven Piece will have you by the Throat from the Very First Page and drag you across Sharp Rocks for its Unrelenting Duration. The Author is known to be writing Fiction in some Form since he was very Little. He became a “Journalist” mainly because he was a Metalhead and a Vocal Fan with a Lot of Opinions, and he wanted to support what he liked and point out "some garbage" as he said before. Wraiths of the Broken Land is a Brutal and Unflinching Tale that takes many of its Cues from both Cinema and Pulp Horror, it is like no Western you've ever seen or read. S. Craig Zahler is an Award-Winning Screenwriter, Director, Novelist, Cinematographer, and Musician. He wrote, directed, and co-composed the Score for the 2015 Film BONE TOMAHAWK, an Independent Spirit Award nominated Picture (Best Screenplay ; Best Supporting Actor) starring Kurt Russell, Patrick Wilson, Matthew Fox, and Richard Jenkins. The Film garnered Praise from Critics and Fans alike. S. Craig Zahler more recently wrote and directed BRAWL IN CELL BLOCK 99, a New York Times Critic’s Pick, starring Vince Vaughn, Jennifer Carpenter, and Don Johnson, which premiered at the Venice Film Festival and also went on to Critical Acclaim. Both Movies were added to the Permanent Collection of the Museum of Modern Art in New York City in 2017. Mel Gibson, Vince Vaughn, and Tory Kittles star in Zahler’s New Crime Drama DRAGGED ACROSS CONCRETE. - "UNE ASSEMBLEE DE CHACALS" (A Congregation Of Chacals) by S. Craig ZAHLER and Published in FRANCE by Gallmeister Editions. The Story starts as follow : In 1888 Oswell Danford is living a Hard but satisfying Life as a Rancher in Virginia when he receives an Unexpected Telegram from One of Oswell's Old Bank-Robbing Gang and the Rest of the boys are also invited. A Wedding Invitation should be Cause to celebrate but not when it means he'll have to face Past Deeds that he's Deeply Ashamed Of. But Someone Else will be there too. Quinlan. He was part of the Gang once, but Betrayal turned an Ally into a Bitter Enemy. He and his Gunmen will be at the Wedding out for Blood...A Congregation of Jackals is an Unrelenting Tale told with a Precise Brutality (Nominated for The Peacemaker Award as well as The Spur Award).